Next i had to fix the rusty go kart rims. This video shows how to fix the rusty rims, fill in with sand-able primer, then paint so the tires will not leak air at the bead. I found out that the original owner messed up the key-way, and ran the rim on one side with out the key, damaging the axle. Instead of throwing them away, i decided to TIG weld the rim and axle back together. I painted the go kart metallic gold, metallic grey, and black with metallic flecks in the paint. After getting a new engine and welding up a custom motor mount with jackshaft for the kart, I was impressed with the power it had! It could pop a wheelie easily, and took off like a rocket. I still needed to upholster the go kart seat, so I made my own using plywood, T nuts, high density foam, marine vinyl, and piping. The kart was pretty much finished, so the rest is just showing it off doing donuts, and wheelies! What about a hill climb in the snow on rocks? I am glad that i welded the sprocket protector on it (do you notice the giant dent in it?) That kept the chain and sprocket from being damaged as it ran over the rocks. I took the go kart out in the winter to see how it would do in the snow. It was able to do a full 720, donuts all over the place, and do its normal thing (be epic). In the middle of a rebuild for this same kart. Trying to evaluate a motor shaft extension on an 8 h.p. Briggs motor with a tapered shaft for torque convertor. Not sure if current shaft has enough length, currently 3″ end to motor housing. One last question, what size sprocket did you use? 54T? 54 or 60 is fine. 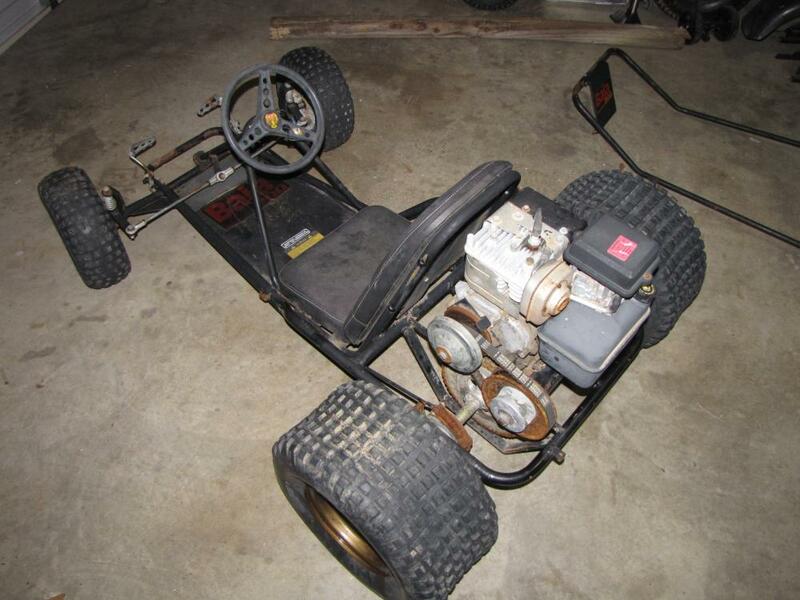 I just bought the same exact go kart. I am going with a predator 420. How long is your jack shaft? I bought a 14″ long 5/8 shaft threaded on bother sides. Will I need a locking collar on the inside of the clutch for the jack shaft? I’m using pillow bearings to support the jackshaft instead of custom making one connected to the motor mount. Was the extra height necessary for the motor mount? Even thought you switched the clutch to the front? Height was for bolts to go through motor mount. They don’t fit if it’s too short. Instead of locking collars, pillow blocks have set screws built into them. You can also use a piece of pipe as a spacer if you want. Nothing wrong with a locking collar though. Can I get a list of pretty much all you used? What kind of jackshaft did you use for the custom motor mount? 5/8″ rod, and i custom fabbed it up using 3/16″ steel plate and some tubing with a 1 3/8″ ID. I like this kart very much.